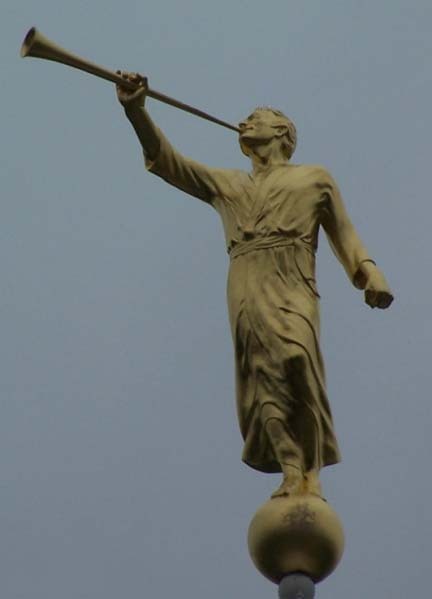 Moroni is the name given by Joseph Smith to the angel that he claimed appeared to him several times in the 1820s. Smith believed that he was the keeper of the gold plates upon which was written, the book of Mormon. The plates were written in unusual characters, referred to as “reformed Egyptian”. Smith hid behind a blanket so no one else could see the golden tablets, and translated them into King James style English. Smith claimed that Moroni instructed Smith to use every means at his disposal to facilitate the translation including the use of a magical stone. Mormon theology says that when Smith finished the translation, the angel Moroni took the gold plates away with him to heaven. In 1826 Joseph Smith was charged with being a disorderly person and an impostor by a court in Bainbridge NY.